At Sims Crane & Equipment, you can find all of the industrial equipment you need to complete construction jobs throughout Florida. We are the state’s leading equipment rental provider, and our team is comprised of industry experts who can assist you with sales, rentals, parts and service, 3D lift planning, and more. 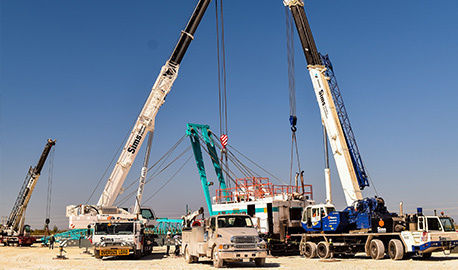 From hoist elevators and forklifts to crawler cranes, mobile cranes, tower cranes, and everything in between, we have the equipment you need to get the job done. When your project requires the vertical transportation of tools and materials, it’s imperative that you have the equipment you need for safe transportation. Used to transport tools, equipment, supplies, construction materials, and crew members, material hoists, also known as hoist elevators, are able to quickly and safely lift materials to your desired location. At Sims Crane & Equipment, our hoists are easy to assemble, so your project doesn’t have to suffer lag time for lengthy equipment setups. They also feature lifting capacities from a few hundred to a few thousand pounds, so regardless of your purpose, we have the ideal piece of equipment for you. In addition, our hoist elevators meet and exceed industry safety standards, are designed for ultimate durability, and feature innovative technology that further increase productivity. Sims Crane & Equipment is also renowned for our vast crane inventory, unmatched customer service, and value-added services. Crane and other equipment rentals are available for daily, weekly, and monthly rental periods, and we offer either operated or bare lease rentals. Our team of experienced and skilled technicians regularly perform crane service on all of our equipment rentals, and they are available for crane service, repairs, and maintenance of privately-owned equipment, as well. Additionally, we offer a range of services you simply won’t find with other industrial equipment rental companies, such as 3D lift planning, machinery moving, and more. We can quickly dispatch technicians, operators, and equipment to job sites in Ft. Myers and elsewhere throughout Florida or help you plan for upcoming projects, so if you need hoist elevators or have any other industrial equipment needs, contact our experts at Sims Crane & Equipment today for more information or to request quotes.